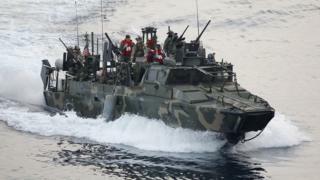 The US has apologised to Iran after 10 American sailors were arrested for entering Iranian waters, the commander of Iran's Revolutionary Guards naval forces has said. General Ali Fadavi accused those detained of "unprofessional" acts. But he suggested the group, who are being held by the guards, could be released soon. The incident comes at a sensitive time, as the US and Iran try to implement the deal on Iran's nuclear activities. US Secretary of State John Kerry has contacted Iranian Foreign Minister Javad Zarif over the incident. Giving his assessment of the talks, Gen Fadavi said "Mr Zarif had a firm stance, saying that they were in our territorial waters and should not have been, and saying that they [the US] should apologise". "This has been done and it will not take long, and the naval force, according to its hierarchy, will act immediately upon the orders it receives," he added. This naval incident comes at a delicate moment for both Washington and Tehran. There are many conservatives and hardliners in both countries who would dearly love to sabotage the deal and consequently both governments may be eager - whatever the attendant rhetoric - to get this episode resolved as quickly as possible. How it plays out will be an important signal as to the balance of power in Tehran itself. The Revolutionary Guard Corps, whose naval branch detained the US vessels and their crews, is amongst the more hardline elements ranked up against the nuclear deal. But the potential economic benefits of lifting the sanctions may be too great an inducement for the agreement to be derailed now. US officials have said the sailors - nine men and a woman - are likely to be released on Wednesday. There has been no confirmation from Washington that Mr Kerry apologised. One of the two US riverine patrol boats developed mechanical problems while on a training mission between Bahrain and Kuwait, the US officials added. The crew and vessels have been taken to Farsi Island, the site of an Iranian naval base.